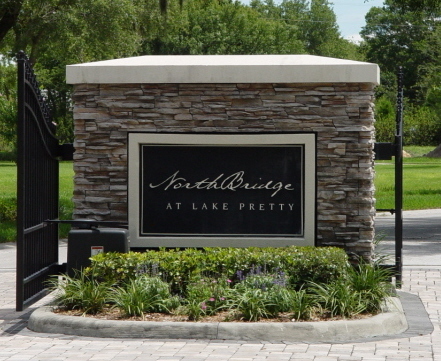 Northbridge at Lake Pretty is a gated , luxury community in Odessa secluded from the hustle and bustle of every day normal life yet close to Veterans Expressway and Tampa International Airport. The ambience is created by the main entry boasting a covered bridge which leads into the community consisting of 32 luxurious custom home sites of a minimum of an acre of land per home. This prestigious neighborhood is surrounded by large oak trees and moss draped cypress trees and provides lake access to non-lake front property owners.